Registration is FREE, but pre-registration is required. 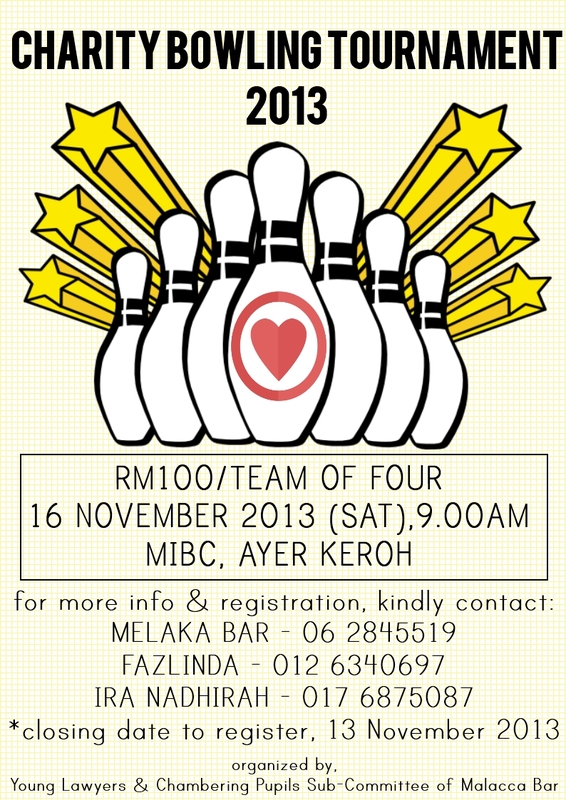 Register with Malacca Bar Committee by phone, fax or email. Attendance of all chambering pupils is compulsory. This public forum carries three (3) CPD points and the event code is 23112013/MLB/MLB7009/3. YLCP will also be organizing a collection of books (e.g. colouring books, drawing books, learning books), food items and fund raising in conjunction with the Charity Campaign for the trainees in Pusat Pemulihan Dalam Komuniti Bukit Baru . The collection of books and food items and fund raising campaign will commence from 25th November, 2013 till 6th December, 2013. Members and pupils are encouraged to send items to be donated to Malacca Bar premises. We would appreciate it if pledges are fulfilled within the campaign period and dry food items are donated (rice, canned food and etc). Let us also be considerate when donating story books or reading materials that are appropriate for the trainee. Help those in need, make them smile.